While in the kitchen, you need good set of tools to prepare the food in a fine manner. Right from utensils to knives, everything has to be perfect so that you have a hassle free and fun filled cooking experience. Speaking of knives, you need a perfect knife, especially for boning purpose and one such knife is Cromova from Global. This Japanese company is known to produce top quality products consistently and this knife is crafted to perfection. The manufacturers have made use of hi-tech blade made of stainless steel. They have complimented the blades with strong and durable components making it a suitable product for everyone. It displays flexible properties, making it easier to slide through any kind of meat or vegetable. The design of such a knife definitely requires appreciation because the makers have ensured that they make a knife that appeal to the masses. Along with outstanding design, they have kept the hygiene aspect in mind as well, where the dirt and food does not enter or are trapped in the knife. When you use sharp objects, often you think of safety issues and while using the Cromova G-21, you can be rest assured that it is not going to harm you. While being watchful of how you use it, there is a finger notch present between the blade and the handle. This offers you immense protection and prevents from cutting yourself. While you are investing a decent amount of money on a product, you should be aware of its durability factor. We all wish to have a product last long and strong, and the good thing about this knife is that it is bound to stay with you for years together without giving up. The name of this product says it all, its highly efficient and equally flexible. In fact, you will get a taste of its flexibility when you start using the knife. Though it is recommended for everyone to use, it works well with small hands too, often people with small hands find it difficult to set themselves with a knife, well, this one works like a charm. There are no complex procedures associated with this knife. Even though it is sharp and has to be used with caution, you can run through any thick piece of meat with much ease. Therefore, settling with such a knife is not going to take time. When it comes to cons, there is nothing to comment on performance or design aspect. The only thing that could work against some consumers is the price. For some it may seem high and not within the budget but at the end of it, you pay for what you get. 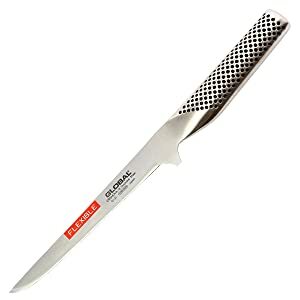 There are many who have bought this knife and Amazon reviews clearly state that the users have simply loved this knife. All they have to say is that it is a perfect knife and gets the job done, it compliments to any kind of cooking purpose, wonderful knife and a kind that deserves five stars. All these terms are what the reviewers have to say about this knife and it clearly suggests as to how people love this product. Cromova G-21 is a very useful, reliable and durable knife. It works for all kinds of people, catering to all cooking needs and requirements. It is a good combination of reliable features and the price is suitable keeping in mind what it offers, you pay for what you get and what you get is something that will live with you for a long time.